since this is my first post, I want to mention that Factorio is great game. However I also have some suggestions for improvement - the first one I would like to address in this thread. The production charts are an interesting feature to get an idea about the overall production, however the corresponding line charts are a little bit confusing. More precisely, the line colors of the production and consumption overview are determined by the sorted production/consumption rate at the time one opens the window (by pressing p). To me it makes more sense to use the same color for the same resource in both charts. In this way it is easy to compare the production und consumption rates graphically. As an example I've marked two exemplary resources which imho should have the same line colors. You even can spin this idea further by using similar colors for similar resources. E.g. Iron ore and iron plates may be colored in different shades of blue. Of course the notion of similarity is not always this obvious. I'd like to see "XY produced" on the left and "XY consumed" on the right to match their colors. e.g. : iron ore prod. is blue, but I consume more copper cables, so on the right side it will be blue. It is really confusing to match colors for items _and_ sides as well, while they can easily change multiple times per second. May I suggest a checbox which could be used to change between "highest usage is blue" and "prod. matches consumption" color settings? Example in screenshot: advanced circuit on both sides, solid fuel only on the right side. Of course, setting filters helped me reproduce the issue, but it applies without filters as well. It allows easier investigation of bottlenecking, which is an important part of any logistics-based workflow. 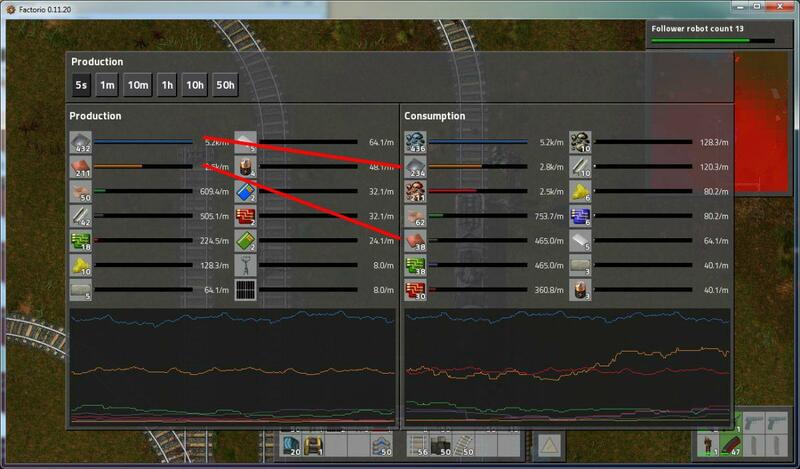 Makes it more visible how train schedule affect the production/consumption peaks and other characteristics such as attack, release. Also, it just makes sense. [Koub] Merged into older topic with same suggestion. I suggest to give each entity a fixed color, so that i.e. Copper Plates are always represented with a blue line. Because it is obvious which line is the highest, so giving the highest line a fixed color does not add any information to the graph. Having a fixed color for an item type however would make the graph much easier readable, because colors would not switch as values and ranks of lines change continuously. That is a good idea, but then we would need hundreds of different colors. At some point, they could be hard to differentiate between.